I’m sitting here at the dining room table with the computer on my lap because, as you can see, three decades worth of correspondence has exploded onto every flat surface within reach. It’s a little overwhelming sharing space with the motherlode of nostalgia in front of you. It also feels like I just won the jackpot. Here in Toronto, we’ve had two wild storms in as many weeks. They left a large number of trees uprooted ( like this historic landmark) and countless basements flooded in their wake. Casa Hobo was lucky enough to avoid damage, but it definitely forced me to survey our subterranean space, aka “The Graveyard of Indecision”, with a more discerning eye. What are my prized possessions down here? What would I save? The letters. Bien sûr! We have a lot of history together. My love for paper and ephemera started early and with the most accessible of utilitarian objects: recipe cards from the “junk drawer” in the kitchen, graph paper pads liberated from my dad’s drafting table, post-it notes from my mom’s clinic. 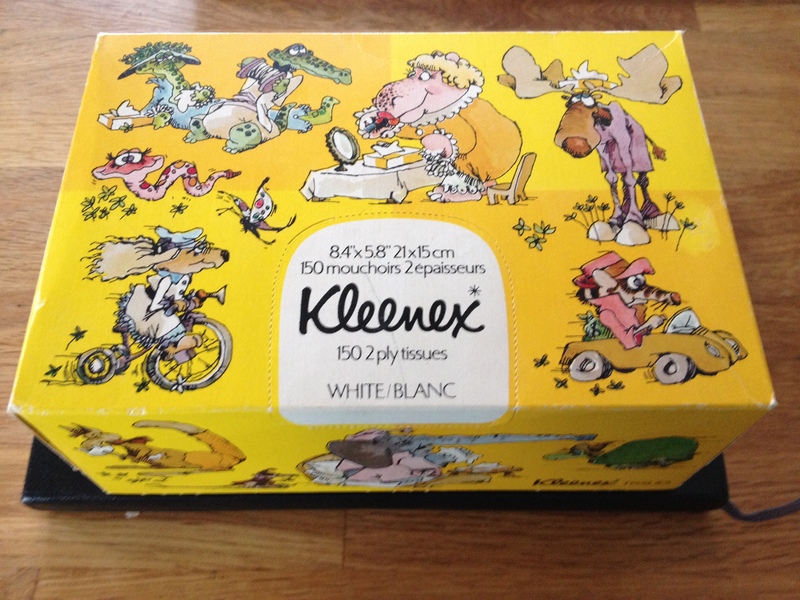 I distinctly remember saving four different shades of pastel-coloured Kleenex (does anyone else remember that fad?) inside an Ovation chocolate box, which was also deemed worthy of collecting for its unusual shape. Welcome to the mind of a weirdo seven year-old. You thought I was joking about the tissues, didn’t you? This is a box I saved from my childhood c. 1980s. When I got older and discovered The Muppets and Hello Kitty , my allowance took a big hit from the stickers and stationary sets. 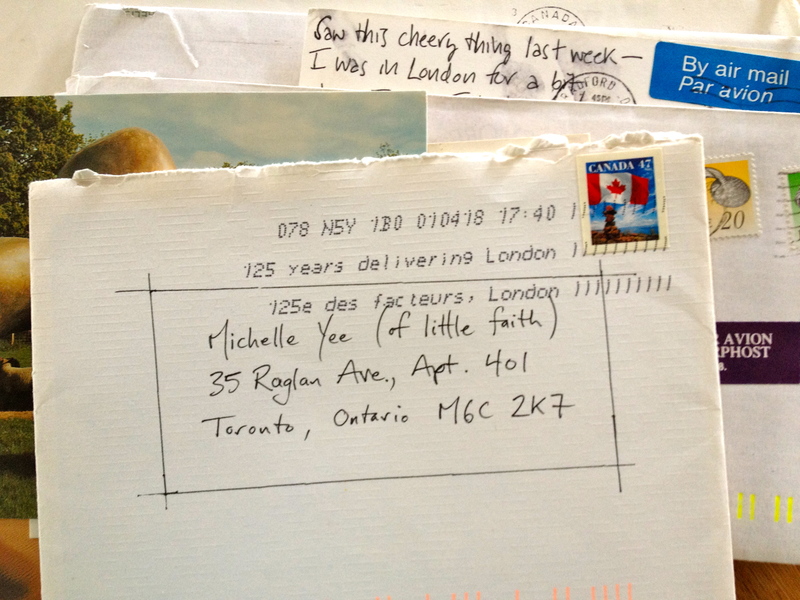 It was also around that time, that my older cousin Audrey took pity on me and started a correspondence, sending short notes about her life in Montreal . Being a few years my senior, everything about her was sophisticated and mysterious to me. How else would I have known exactly how annoying older brothers were and what it was like going to a school run by nuns? 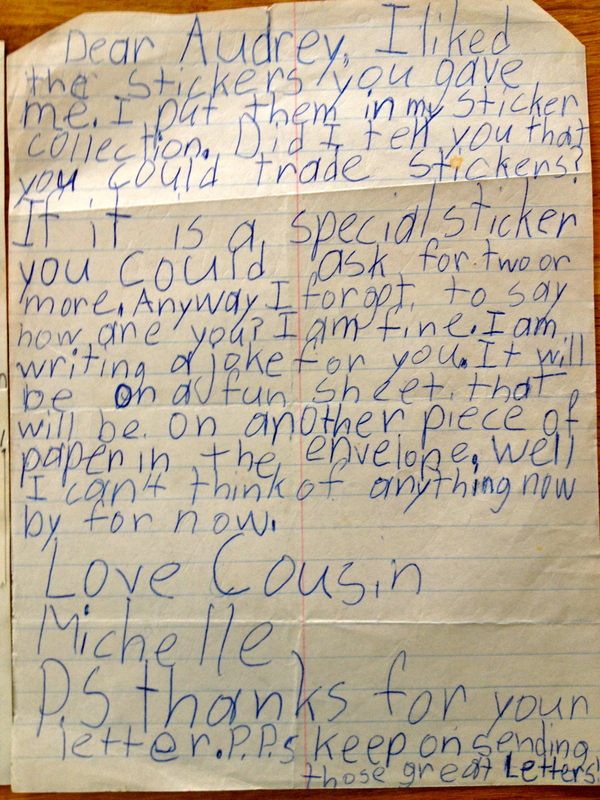 While I had little of interest to report from grade school (see letters below for evidence of this) I certainly put an extra effort into picking the right stationary and accoutrements to make an impression. Cue the scratch ‘n sniff stickers, googly eyes, and scented markers. And so began a lifelong love of snail mail, not only for the excitement of receiving news from afar, but also for the chance to send something out into the world that might somehow communicate who or how you were , even if you weren’t old enough to have the words for it. 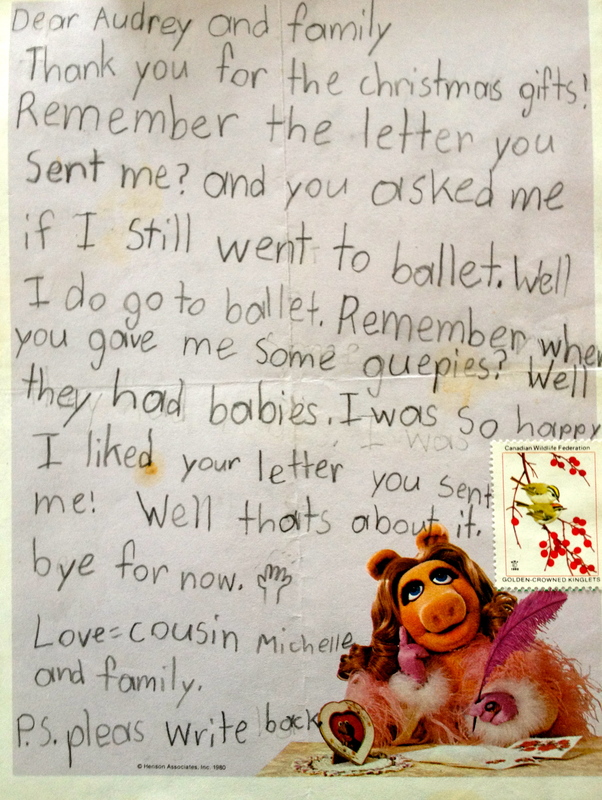 Okay, I’ll say it: Miss Piggy paper unwittingly helped me tap into the joy of creative expression. This week’s muse is snail mail. 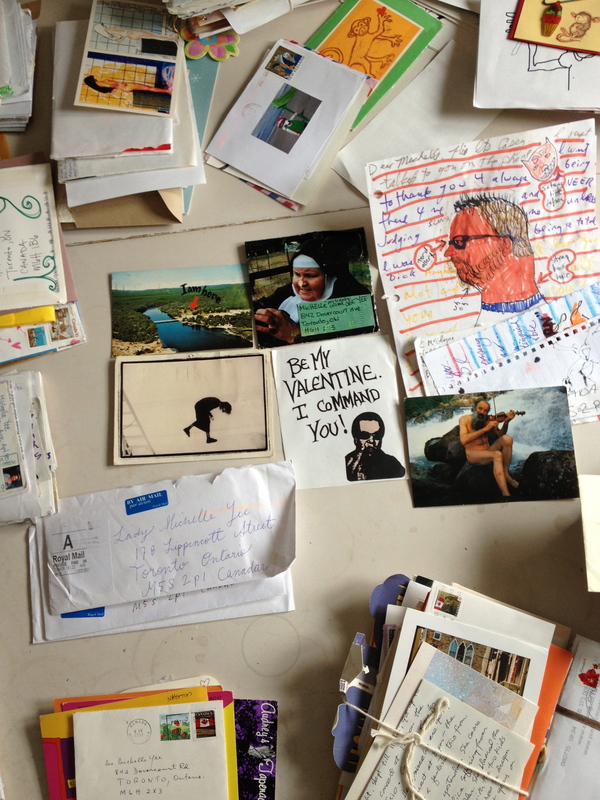 In my back pocket, are some neat links about the art of lettering writing, inspiring missives – illustrated and otherwise – from my personal archives, and lots of correspondence-related eye candy to share. I’m getting so excited thinking about it that I feel it’s time to put pen to paper and send some fun mail out into the world right now. Until tomorrow!